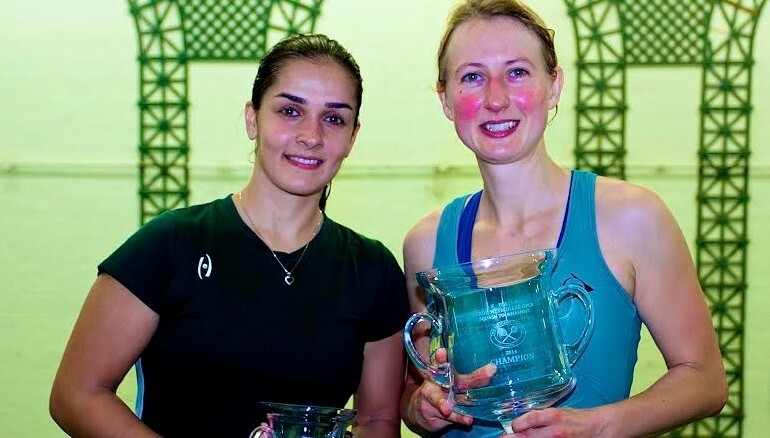 It was appropriately at Heights Casino in New York that England’s Alison Waters recorded a new high in her illustrious squash career – winning the WSA Gold 50 Carol Weymuller Open to claim her 10th, but biggest, Tour title. The 30-year-old Londoner reached a career-high world No3 ranking in October 2010 – but just a year later saw her ranking plummet to 44 after taking time out to recover from an Achilles injury. 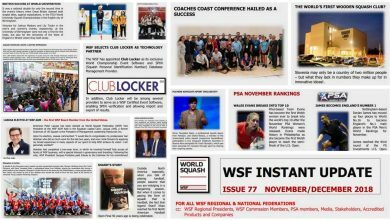 Waters was back in the world top five by the end of 2012 – since when she has won a fourth British National Championship title and, in August, secured a silver Commonwealth Games medal in the Mixed Doubles in Scotland. 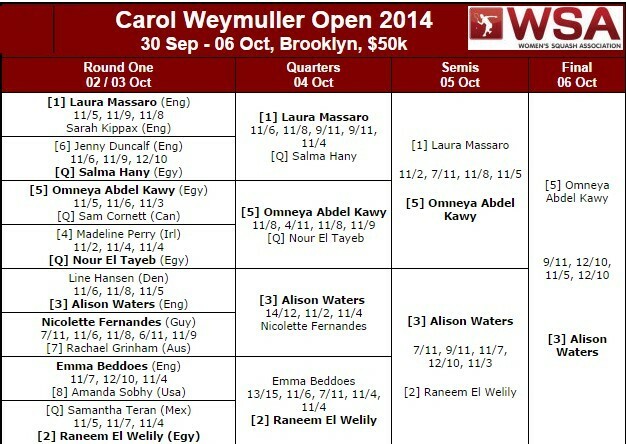 Seeded three, the world No7 made her New York breakthrough in the semi-finals, where she ousted Egypt’s world No3Raneem El Welily to set up a final meeting with Omneya Abdel Kawy, the fifth seed from Egypt. The pair’s competitive history goes back to January 1998 when they met in the final of the British Junior U14 Open – with the Egyptian recording a 6-9, 9-1, 9-4, 9-6 victory! Waters held a 10-5 Tour head-to-head advantage going into the match – and was the winner of their most recent clash earlier this year in five games. World No14 Abdel Kawy (pictured above, right, with Waters) won the first game and moved through to game-ball at 10-8 in the second. Precise play from Waters in the third saw the Londoner move ahead 2/1. “The fourth game was a complete 360 degree turn at the beginning, with Omneya getting a very fast and easy lead of 6-1, mainly from Ali’s unforced errors. Omneya continued through and at 8-3 we were definitely all thinking that this match was going to five games,” explained Elriani. “Yet once again Ali was not going to give up lightly, she pushed up the court, started to volley more, took some wonderful short shots in and changed the momentum in her favour. Ali went from 4 to 9 in one hand and with the game now at 9-9 we wondered who would play these last big points the best. Comeback-Queen Waters was overjoyed with her victory: “I’m really, really delighted to have won! It’s been two years since I won a title and to win it here of all places is extra special!! 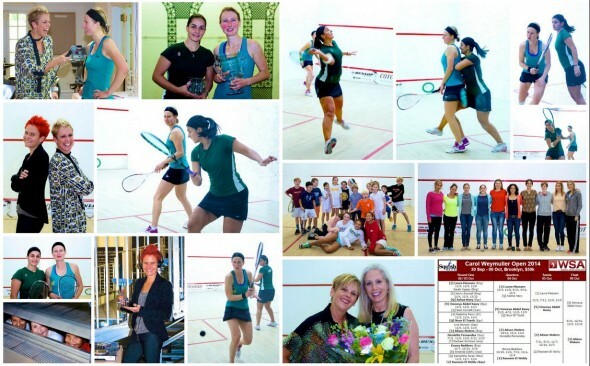 “It was another tough match: Omneya played really well and I could have gone 2/0 down! I’m pleased with how I stuck in there and just kept going, which was key all week in all my matches. That’s what I’m most happy with, is my attitude and commitment to it. 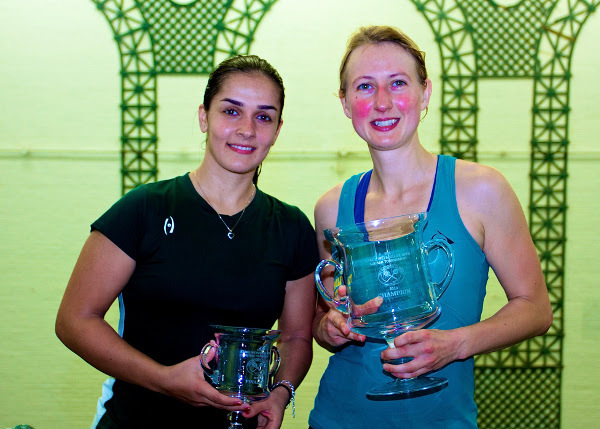 Cairo-based Abdel Kawy was pleased overall with her Carol Weymuller campaign: “I wanted to finish it good, but it was still a good week. I was playing well and took the first game and in the second I was up 10-8 and my head started to think stuff!! “So I put pressure on myself – which was the last thing I wanted to do this week. But it happened and my shots weren’t working as well as when I was relaxed. My volley drop was great and in the end it wasn’t as accurate.